Due to last Wednesday’s holiday, comparisons are to 2 weeks ago unless otherwise noted. CBS: BIG BROTHER was up 0.6 from last week’s July 4th episode, but steady with 2 weeks ago at 1.5, and the same was true for CODE BLACK, up 0.2 from last week but steady with the 0.8 from 2 weeks ago. Between them, TKO: TOTAL KNOCK-OUT debuted at an OK 0.9. FOX: MASTERCHEF (0.9) and 24 HOURS TO HELL AND BACK (0.9) were both down 0.2. 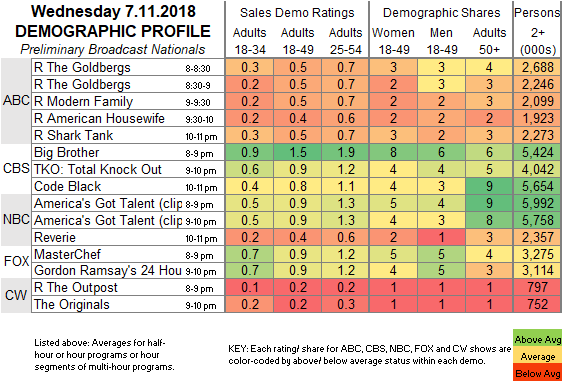 CW: At least for now, the rerun of THE OUTPOST pilot is 0.1 higher than Tuesday’s premiere, although that still only put it at 0.2. THE ORIGINALS aired its first new episode in 3 weeks, down 0.1 to 0.2. 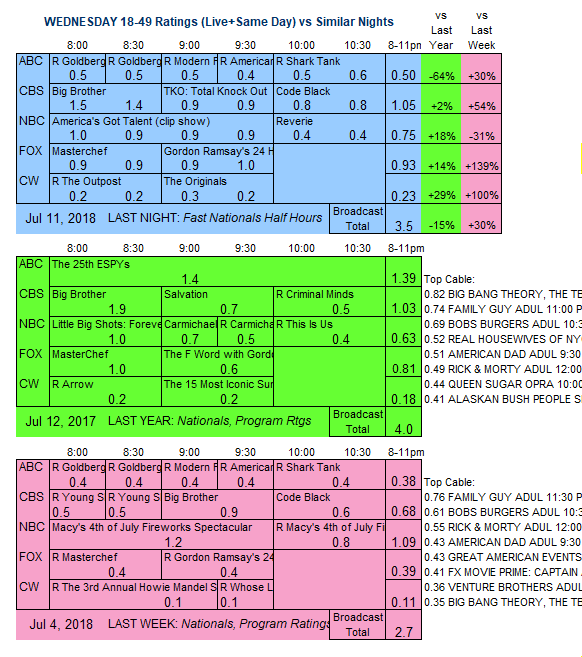 NBC: An AMERICA’S GOT TALENT clip show special was at 0.9, then REVERIE held at 0.4. Tonight, NBC’s LITTLE BIG SHOTS and MARLON air their season finales.